On March 2-4, the Mesothelioma Applied Research Foundation and the National Cancer Institute (NCI) will co-host the annual International Symposium on Malignant Mesothelioma at the National Institutes of Health (NIH). 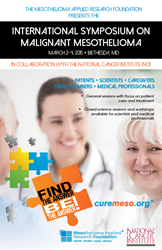 On March 2-4, the Mesothelioma Applied Research Foundation (Meso Foundation) and the National Cancer Institute (NCI) will co-host the annual International Symposium on Malignant Mesothelioma at the National Institutes of Health (NIH), in Bethesda, Maryland. The event comprises two parts: one part is dedicated to medical professionals and scientists who specialize in mesothelioma, while the other is directed to the general public, including patients, their families, and caregivers. The conference begins on Monday, March 2 with science and general sessions. Monday night includes an Awards Dinner honoring community members who have contributed in meaningful ways in the fight against mesothelioma. How our immune system interacts with mesothelioma cells is an important question researched in Dr. Ottensmeier’s work. By analyzing biospecimen from patients, this work searches for clues in the immune system that can be used to predict outcomes of therapy or to design novel therapeutics. Evading immunity is one of the most important survival mechanisms for mesothelioma cells. Dr. Dao studies development of antibodies that can induce the immune system to attack mesothelioma cells. Such empowerment of the immune system can result in robust anti-tumoral effects against mesothelioma. Dr. Farassati’s work pursues the development of a novel class of viruses that are capable of targeting mesothelioma cells while leaving normal cells untouched. A new generation of these viruses developed in Dr. Farassati’s lab attack stem cells within the tumor or "cancer stem cells" as a novel strategy against mesothelioma. Radiation therapy is one of the approaches used against mesothelioma with limited success. Dr. De Perrot’s research focuses on enhancing the effects of radiation therapy by studying the role of the immune system in this scenario. The hope is that this research will result in enhanced effectiveness of radiation therapy. More information about the event is available at http://www.curemeso.org/symposium.